The second J. L. Smith occurrence was in 1948. Mr. And Mrs. James L. Smith, Marshal, Missouri, requested Wright to design a home for them. The first letter was dated August 24, 1948. The fifth and final letter was from Frank Lloyd Wright on November 6, 1948. "Dear Mrs. Smith: We do not build on less than acreage - sorry." The third is this project. After having the opportunity to review all of the correspondence for all three projects, there were no references to earlier projects, which leads to the conclusion that Smith was a common name, and it was just a coincidence that all three had the initials "J. L." in there name. Wright/Smith Correspondence: In the Avery Library there twelve letter and notes between Frank Lloyd Wright, Gene Masselink and J. L. Smith. October 30, 1953: "Dear Mr. Frank Lloyd Wright: Could we make an appointment to see you about designing a home for us? We came up to Spring Green early this year to talk to you, but Mr. Hill informed us that you were away lecturing at that time... The typo map is enclosed..." J. L. Smith, Dundee, Illinois. November 7, 1953: "Dear Mr. Smith: Mr. Wright has been in New York almost continuously since October 7th in connection with the exhibition of his work there on Fifth Avenue at the site of the Guggenheim gallery... If you could send Mr. Wright a complete list of your requirements, and give his an idea of your financial limitations..." Eugene Masselink. 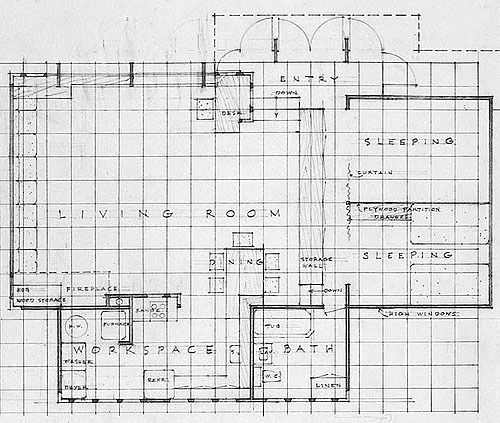 preliminary plan for a "One Room House" in Monograph 1951-1959, p.143. Although undated, Pfeiffer dates the plan 1954. The "One Room House, Usonian Automatic System, 980 square feet," included a Living Room, Workspace, two Bedrooms and one Bath. 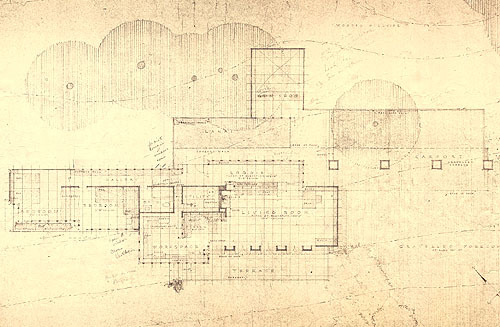 Included in the Smith file are three additional undated preliminary plans, all "Usonian Automatic" and all two-bedrooms. B) A second variation is "870 Square Feet." C) A third variation has a couple hand written notes, "$5000 Cottage," "1028 sq. ft." and "1180." Because these four preliminary drawings are only titled "Usonian Automatic" it might be assumed that these early plans may have been left in this file by accident. But the fourth gives a clue that they belong. D) The fourth variation has the addition of a detached "Gun Shop" which becomes a common thread and important element in all of the Smith plans. Pfeiffer indicates that these first preliminary plans were to minimal for the Smiths, and a larger plan was then proposed. A-1) Preliminary Plan. 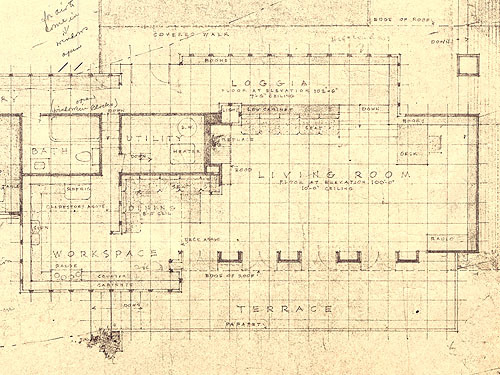 "One Room House, Usonian Automatic System, 980 square feet," included a Living Room, Workspace, two Bedrooms and one Bath. Published in Monograph 1951-1959, p.143. Courtesy of the Frank Lloyd Wright Foundation. A-2) Preliminary Plan Detail. Doors in the Entry open outward, eliminating the corners. From the Entry and Bedrooms, stairs lead down to the Living Room level. There is only a storage wall separating the Living Room from the Bedrooms. A curtain is indicated for Bedroom privacy. A-3) Preliminary Plan Detail. The floor to ceiling Entry doors open outward, eliminating the corners. The upper perforated blocks are glazed with glass. 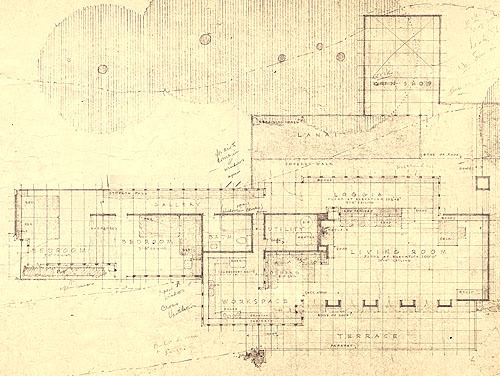 Wright/Smith Correspondence Continued: The second set of plans, (Scheme 2), is dated January 20, 1955 and is for a much larger home, over 1,500 square feet when you include the Gun Shop. This design placed the two bedrooms at Northwest end of the house, the Workspace, Bath and an additional Utility room in the center, and the Living Room on the Southeast end. A Loggia/Gallery ties the rooms together and runs along the Northeast side of the home. A Carport is connected to the Living Room and continues Southeast. The Gun Shop is separated by the Lanai and is embedded into the hillside. There are seven sheets in the file that are related to the Scheme. Four of which are titled "House for Mr. & Mrs. J. L. Smith." 1) "Elevations." 2) "General Plan." 3) "Sheet 2, Plot Plan." 4) "Sheet 3, Elevations." 5) "Southwest Elevation." A variation on the Carport. 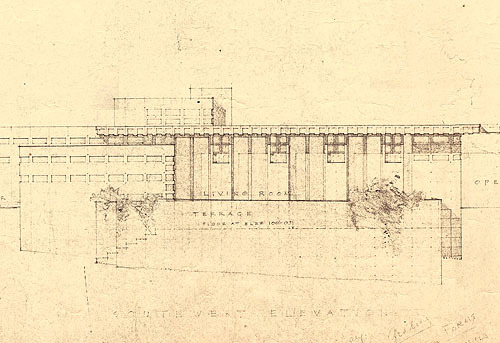 6) "Southwest Elevation." A variation on the Living Room. 7) "Southwest Elevation." A variation on the Living Room. On January 26th, 1955 the Smiths were billed $1,250. "On account for Preliminary Sketches,,, 5% of $25,000, proposed cost of house..."
enthusiastic we become. We have been reading your new book Natural House and would like to build as much of our home as we can... Will a work shop dug into the hill be warm, dry and comfortable to use. I store French walnut gun stock blanks, tools, parts in the shop; all of which should not get damp. Wouldn't it be better to have the shop parallel to the home instead of into the hill to reduce digging into the hill... Can we work out storage for a 16 ft Old Town Canoe near the carport. Can we make a high step in the retaining wall behind carport to store the canoe. Sincerely J. L. Smith." Masselink responds a week later, "Dear Mr. Smith, Mr. Wright acknowledges your check with thanks. As soon as he is back from Wisconsin and New York he will give your letter his careful attention... February 10th, 1955. P.S. We would need the preliminary sketches before work could begin upon the working drawings." "May 21, 1955... On March 11, we returned our sketches to you by registered mail, since we have not heard from you we would like to know if they were received... If Mr. Wright will be in Wisconsin the beginning of June or so, we would like to make a date to come up to see him, Yours truly, J. L. Smith." 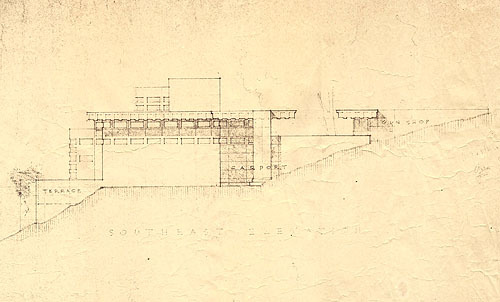 1B) Detail of the J. L. Smith Elevations Blueprint 1955. 1C) J. L. Smith Elevations Blueprint 1955. Detail of the Southeast Elevation. The Terrace is on the far left. The ceiling in the Workspace is lowered for the first three feet, then raises up to the height of the Living Room. The Loggia is to the right of the Living Room, and lines up with the Carport in the foreground. The Gun Shop is to the far right, embedded into the hillside. 1D) J. L. Smith Elevations Blueprint 1955. Detail of the Southwest Elevation. The two Bedrooms are on the far left (out of frame). The Workspace is to the left, the ceiling has been lowered. The Living room has four sets of floor-to-ceiling doors that open outward, set between two foot wide columns. The carport is to the far right (out of frame). 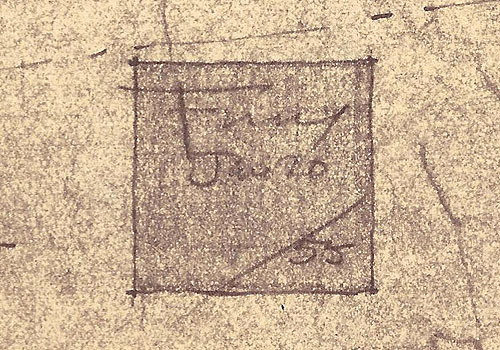 1E) Detail of dated blueprint, "Jan 20 / 55." 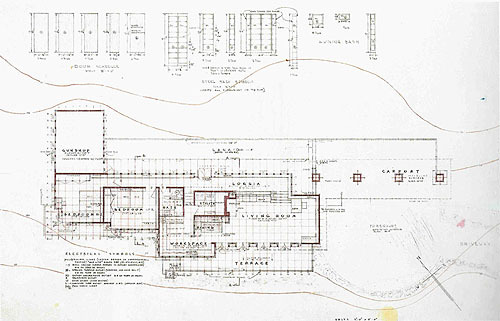 2B) Detail of the J. L. Smith General Plan Blueprint 1955. Each door is 2' x 10' creating 2' x 4' sets, between 2' wide columns. The height of the ceiling above the upper level is 7' 6" and is 10' above the lower level. A built-in planter borders the stairs that lead down from the Terrace. From the Entry, as you turn right, the Gallery leads to the Bath and two Bedrooms. Built-in cabinets are on the right side. Both Bedrooms have floor-to-ceiling corner sets of doors. When closed they create the corner of the room. When they are opened outward, the corner is open. The smaller Bedroom set has one door that is 2' wide, the other is 1' wide. The larger Bedroom set are both 2' wide. The roof extends outward above the doors sheltering the openings. There is a large built-in planter box just outside the larger bedroom. There are handwritten notes in pencil. Shop: "Gun" is crossed out and replaced with "Work." "To wk in winter. Shop must be comfortable. Heat Ste. No Sun in afternoon. Stairway to top of hill. Gallery: For air to come in > Windows open. (Open windows in Blocks.) Large Bedroom: Open windows. Small Bedroom: Open windows. Cross ventilation. Workspace: Built in oven + Range." 2C) J. L. Smith General Plan Detail. The home is built on two levels. As you park in the Carport, a covered walk leads to the Entrance which is along the back of the house. The Lanai is on the right, the Gun Shop is embedded into the hillside. Double doors lead to the Entryway which is on the upper level. The Gallery on the right leads to two Bedrooms, the Bath, and a thin passageway leading down five stairs to the Workspace on the lower level. As you walk down the Loggia to the left, there are built-in bookshelves on the left, low built-in cabinets on the right. The wall on the right side is open, creating the Loggia. At the end, five stairs lead down to the Living Room. The bookshelves that cover the right side of the Loggia wrap around the end, then continue into the Living room and rap around two additional walls. The Southwest side of the Living room has four sets of tall thin floor-to-ceiling doors that open outward to the Terrace. 2D) Detail of the J. L. Smith living area. Each door is 2' x 10' creating 2' x 4' sets, between 2' wide columns. The height of the ceiling above the upper level is 7' 6" and is 10' above the lower level. A built-in planter borders the stairs that lead down from the Terrace. From the Entry, as you turn right, the Gallery leads to the Bath and two Bedrooms. Built-in cabinets are on the right side. Both Bedrooms have floor-to-ceiling corner sets of doors. When closed they create the corner of the room. When they are opened outward, the corner is open. There is a large built-in planter box just outside the larger bedroom. 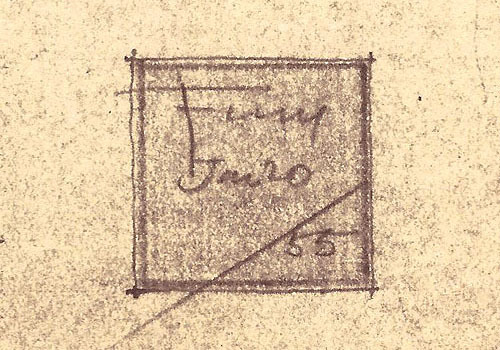 2E) Detail of dated blueprint, "Jan 20 / 55." Wright/Smith Correspondence Continued: On January 31, 1956, Smith received a registered package from Frank Lloyd Wright. The third, final and complete set of plans, Scheme 2B, appear to be dated February 15, 1956. There are eight sheets, each is titled, "House For Mr. & Mrs. J. L. Smith. Kane County, Illinois. Frank Lloyd Wright Architect. Frank Lloyd Wright." The only major change was to move the Gun Shop "parallel to the home instead of into the hill" like Smith had suggested. The sheets include: Sheet 1, Plot Plan; Sheet 2, General Plan; Sheet 3, Elevations; Sheet 4, Sections; Sheet 5, Electrical (2); Sheet 6, Details of Workspace; Sheet 7, Roof Plan. On March 24th, Masselink sent Smith a letter, "Your working drawings and specifications were mailed directly from the Arizona Blue Print Company - We hope you received them safely." On April 4th, Smith responds with a hand written note, "Thank you for the beautiful plans. We are having a contractor in Elgin, Mr. Hartman look at them. He is enthusiastic about working with us. I would appreciate the blue-prints of the block forms - the detailed drawings of metal forms for all type blocks. Yours truly, J. L. Smith." Two weeks later Masselink responds. "Dear Mr. Smith: This will acknowledge your letter and your check of one thousand dollars. Thank you. We are glad to know you have a contractor who is enthusiastic about working with you. That should be a great help. We are leaving for Wisconsin shortly and will send you the prints of the block forms then - if not before. April 16th, 1956." etc? Sincerely, Eugene Masselink. Secretary to Frank Lloyd Wright. Sept 26th, 1956." End of correspondence. Silence... There is no record as to why Smith did not build the home. He owned the lot. Wright was very accommodating. Smith seemed pleased. He had a contractor that was enthusiastic. Everything was falling into place. At this time, there is just not enough information related to J. L. Smith that would answer the question. This project became one of the 500 that would never come to fruition. 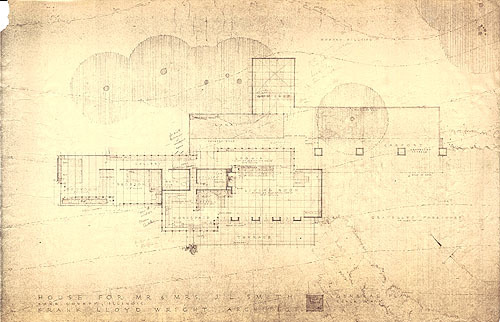 According to Pfeiffer, "The J. L. Smith house is another Usonian Automatic with an elongated plan stretching from the carport at one end to the master bedroom at the other. A covered walk proceeds from the carport at one end to the master bedroom at the other. A covered walk proceeds from the carport to a gun shop set at right angles to the last bedroom. Partway along the covered walk is the entrance to the house, gaining a loggia on the left as one enters with five steps down into the living room. Near the fireplace are the dining alcove and workspace. By staggering the bedrooms in the plan, each room has the advantage of a corner open-swinging window. 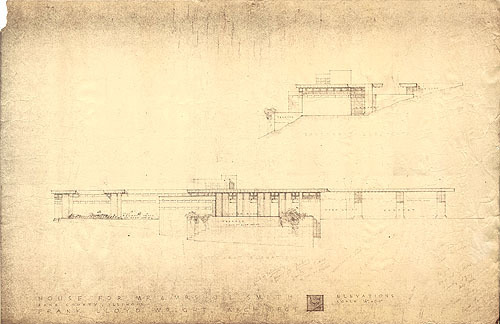 As is apparent from the study of the elevations, the combination of solid blocks and perforated ones is unlike any of Wright�s other Usonian Automatic designs.. Frank Lloyd Wright, Complete Works 1943-1959, Pfeiffer, 2009. C) J. L. Smith Final Plan, Sheet 2, General Plan. Gunshop has been moved as Smith had suggested. 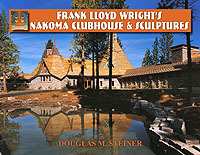 Published in Frank Lloyd Wright, Complete Works 1943-1959. Courtesy of the Frank Lloyd Wright Foundation. Usonian Automatic Homes, 1949, Frank Lloyd Wright Foundation Project Number 5612. 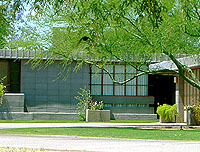 As early as 1923, Wright designed four textile block homes in California. 1) Millard (La Miniatura) (1923 - S.214), 2) Storer Residence (1923 - S.215), 3) Freeman (1923 - S.216 and 4) Ennis (1923 - S.217). 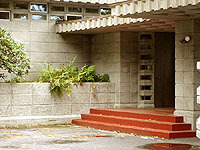 Wright designed many homes utilizing the concrete block including many of the his Usonian homes. The first home generally recognized as a Usonian home was the Jacobs 1, 1936. It was not until 1949 that Wright began solidifying his concepts for the Usonian Automatic Home and refined the design over the next two year. The first Usonian Automatic Homes was the Benjamin Adelman House, FLLW 5101 (1951 - S.344). Other completed homes include the Arthur Pieper Desert Cottage, FLLW 5218 (1952 - S.349), Gerald Tonkens House, FLLW 5510 (1954 - S.386), Dr. Toufic H. Kalil House, FLLW 5506 (1955 - S.387), Dorothy Turkel House, FLLW 5513 (1955 - S.388), William B. Tracy House, FLLW 5512 (1955 - S.389) and T. A. Pappas House, FLLW 5516 (1955 - S.392). 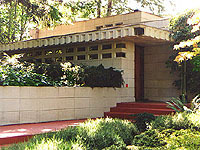 The J. L. Smith Residence was one of the homes designed as a Usonian Automatic. Others homes designed but never executed included the Blumberg and Sussman Residences, both 1955. From January 1988 through March 1991, "Frank Lloyd Wright: In The Realm of Ideas" a traveling exhibition included a full-scale Usonian Automatic model. The design that was chosen for the full-scale model was the Sussman Residence (project). 1949 - The Usonian Automatic Project, FLLW 5612, p.216-217*. 1953 - Pieper-Montooth Building, Project, "Horizon Builders," FLLW 5311, p.337*. 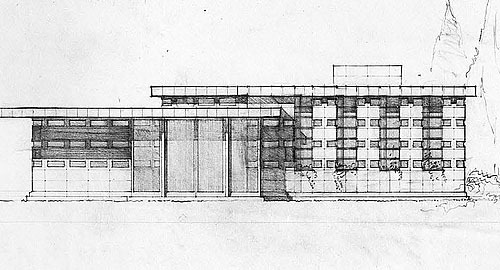 1954 - Louis B. Fredrick House, Project, Scheme 1, FLLW 5426, p.363*. 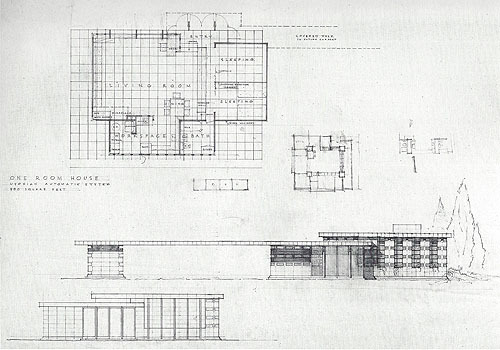 1954 - Arthur J. Levin House, Project, FLLW 5633, p.373*. 1955 - Mel Blumberg House, Project, FLLW 5502, p.388*. 1955 - Clinic for Dr. Kundert and Dr. Fofo, Project, Scheme 1, FLLW 5640, p.408*. 1955 - Don Lovness Original House, Project, FLLW 5507, p.412*. Was constructed of stone, S.391. 1955 - Oscar Miller House, Project, FLLW 5602, p.413*. 1955 - Robert Sunday House, Original Project, FLLW 5522, p.425*. Was constructed of brick, S.393. 1955 - Gerald Sussman House, Project, FLLW 5524, p.426*. 1956 - Andrew B Cook House, Project, Scheme 2, FLLW 5525, p.444*. 1956 - David Hunt House, Project, FLLW 5601, p.457*. 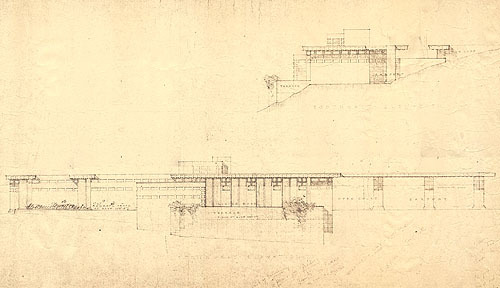 1956 - Leonard Janowski House, Project, Scheme 2. FLLW 5538, p.458*. 1957 - Usonian Housing, Project for Walter Bimson. FLLW 5740, p.495*. 1957 (S.421) - Dr. Robert G. Walton House, originally called for Usonian Automatic construction, abandon for standard concrete block construction. FLLW 5623, p.519-520*. Text copyright Douglas M. Steiner, Copyright 2017. Description: "House For Mr. & Mrs. J. L. Smith. Kane County, Illinois. Frank Lloyd Wright Architect. Frank Lloyd Wright, Jan 20 / 55. Elevations. Scale 1/4" = 1' - 0"." Upper: "Southeast Elevation." The Terrace is on the far left. The ceiling in the Workspace is lowered for the first three feet, then raises up to the height of the Living Room. The Loggia is to the right of the Living Room, and lines up with the Carport in the foreground. The Gun Shop is to the far right, embedded into the hillside. Lower: "Southwest Elevation." The two Bedrooms are on the left. Both have corner doors that open outward. The Workspace is to the right of the Bedrooms, the ceiling has been lowered. The Living room has four sets of floor-to-ceiling doors that open outward, set between two foot wide columns. The carport is to the far right. There are handwritten notes in pencil toward the bottom right. "Print of Preliminary Plans for Grading Prints on Forms as Soon as Possible. Workshop - Dry - Gun Shop. Fireplace Storage. No Cabinets over Sink. Carport. View out of Kitchen... Laundry Equip, deep sink. Canoe Storage. Lanai Larger. Laundry Larger." The notes on both sheets, and the fact that Gun Shop was relocated, would indicate that the Smiths were very serious about completing this project. We were not able to uncover why the project was never built. See Wright Study on J. L. Smith Residence Project. Size: Original Blueprint 24" x 36". Description: "House For Mr. & Mrs. J. L. Smith. Kane County, Illinois. Frank Lloyd Wright Architect. Frank Lloyd Wright, Jan 20 / 55. General Plan. Scale 1/4" = 1' - 0"." The home is built into a hillside and faces Southwest. The elevation at the South corner of the Terrace is 92 feet. The elevation of the North corner of the Gun shop is 110 feet, a change of 18 feet. As in other Usonian Automatic homes, these blocks are 1' x 2' in size, and the floor plan is designed in 2' x 2' modules. The home is built on two levels. As you drive up to the graveled forecourt, and park in the Carport, a covered walk leads to the Entrance which is along the back of the house. The Lanai is on the right, the Gun Shop is embedded into the hillside. Double doors lead to the Entryway which is on the upper level. The Gallery on the right leads to two Bedrooms, the Bath, and a thin passageway leading down five stairs to the Workspace on the lower level. As you walk down the Loggia to the left, there are built-in bookshelves on the left, low built-in cabinets on the right. The wall on the right side is open, creating the Loggia. At the end, five stairs lead down to the Living Room. The bookshelves that cover the right side of the Loggia wrap around the end, then continue into the Living room and rap around two additional walls. The Southwest side of the Living room has four sets of tall thin floor-to-ceiling doors that open outward to the Terrace. Each door is 2' x 10' creating 2' x 4' sets, between 2' wide columns. The height of the ceiling above the upper level is 7' 6" and is 10' above the lower level. A built-in planter borders the stairs that lead down from the Terrace. From the Entry, as you turn right, the Gallery leads to the Bath and two Bedrooms. Built-in cabinets are on the right side. Both Bedrooms have floor-to-ceiling corner sets of doors. When closed they create the corner of the room. When they are opened outward, the corner is open. The smaller Bedroom set has one door that is 2' wide, the other is 1' wide. The larger Bedroom set are both 2' wide. The roof extends outward above the doors sheltering the openings. There is a large built-in planter box just outside the larger bedroom. There are handwritten notes in pencil. Shop: "Gun" is crossed out and replaced with "Work." "To wk in winter. Shop must be comfortable. Heat Ste. No Sun in afternoon. Stairway to top of hill. Gallery: For air to come in > Windows open. (Open windows in Blocks.) Large Bedroom: Open windows. Small Bedroom: Open windows. Cross ventilation. Workspace: Built in oven + Range." 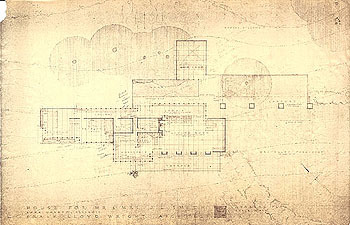 The Gun Shop was moved to the North corner of the home in the floor plans published in "Frank Lloyd Wright, Complete Works 1943-1959". See Wright Study on J. L. Smith Residence Project. Size: 10 x 8 Color Print. Description: "House For Mr. & Mrs. J. L. Smith. Kane County, Illinois. Frank Lloyd Wright Architect. Frank Lloyd Wright, Jan 20 / 55. General Plan. Scale 1/4" = 1' - 0"." The home is built into a hillside and faces Southwest. The elevation at the South corner of the Terrace is 92 feet. The elevation of the North corner of the Gun shop is 110 feet, a change of 18 feet. As in other Usonian Automatic homes, these blocks are 1' x 2' in size, and the floor plan is designed in 2' x 2' modules. The home is built on two levels. As you drive up to the graveled forecourt, and park in the Carport, a covered walk leads to the Entrance which is along the back of the house. The Lanai is on the right, the Gun Shop is embedded into the hillside. Double doors lead to the Entryway which is on the upper level. The Gallery on the right leads to two Bedrooms, the Bath, and a thin passageway leading down five stairs to the Workspace on the lower level. As you walk down the Loggia to the left, there are built-in bookshelves on the left, low built-in cabinets on the right. The wall on the right side is open, creating the Loggia. At the end, five stairs lead down to the Living Room. The bookshelves that cover the right side of the Loggia wrap around the end, then continue into the Living room and rap around two additional walls. The Southwest side of the Living room has four sets of tall thin floor-to-ceiling doors that open outward to the Terrace. See Wright Study on J. L. Smith Residence Project.